How do I rent a storage unit? How do I pay for my storage unit? No, the basic rental period is one (1) month. Thereafter, it’s a month-to-month agreement. When will my rent be due? Your monthly rent is due on the day of the month you rented the unit. There are No Rent Refunds. If you’re going to move out in the middle of your billing cycle, let us know Before You Pay Your Rent AND Before Your Rent is Due. We will calculate your rent due thru the move out date and only charge you for the days you’re going to use the unit. Check out the “Tabs” (Above) here on our website OR give us a call during office hours. 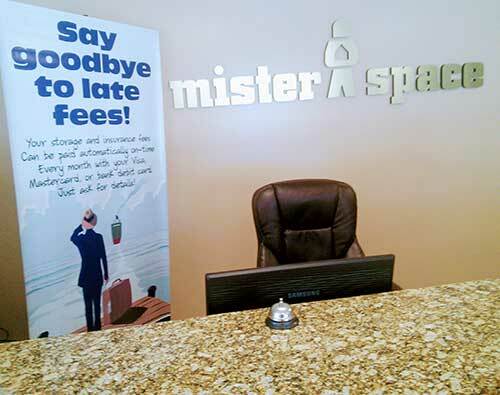 After office hours leave us a message OR send us an email to info@misterspaceselfstorage.com and we’ll respond as soon as possible. *We do not keep a key to your unit. Exterior units must be secured with a “Bullet” lock. Interior units must be secured with a “Disk” (Round) padlock. We sell both kinds of locks at discount prices.